The event is taking place at the R. S. Amegashie Auditorium, at the Business School of the University of Ghana Legon today 20th November at 10am. 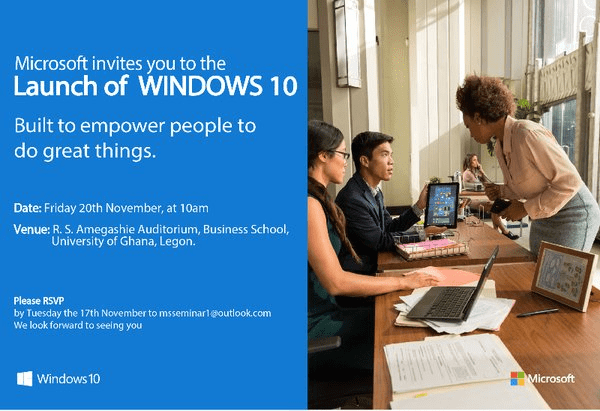 Come join the Ghana launch of Windows 10, learn the new features of Microsoft’s new Operating System and learn how it empowers you to do great things. Student on Legon campus? and looking forward to meet the Microsoft community here’s your chance. If you are unable to be there, follow the event via the hashtag #Windows10Gh on twitter.